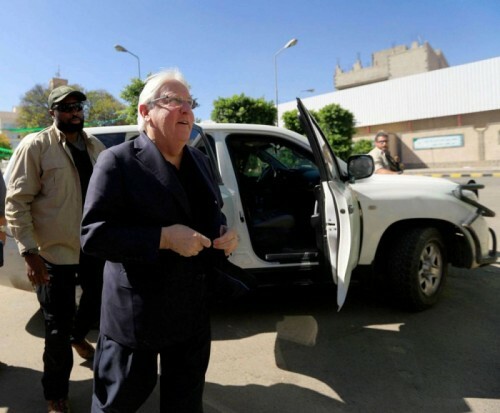 The UN special envoy to Yemen starts Saturday a 3-day trip to the Houthi-held capital of Sana'a to finalize the Hodeida redeployment plan's first stage. Martin Griffiths and Michael Lollesgaard, head of the Redeployment Coordination Committee, will meet with Houthi leaders in Sana'a, the Saudi Asharq al-Awsat paper quoted UN source as saying anonymously on Friday. According to other sources who met with Griffiths the last two weeks, the UN envoy has repeatedly talked about "obstacles and difference in opinions, and the pact implementation should not be a hostage in the hands of skeptics," the paper added. Some people don't want the Hodeida deal to succeed, and the UN envoy spends time with those who want it to succeed from both sides, said the sources noting that Griffiths had not concealed his determination to go ahead with talks to end the war. Having asked anonymity, the sources cited Griffiths as saying "we have rare diplomatic moment to stop war. Alternative is famine and terrorism, and Yemeni people will pay the price." Parties to the 4-year war in Yemen, after 8-day peace talks in Sweden, reached on the 13th of last December an agreement providing for ceasefire in Hodeida and redeployment of both sides' forces in the Red Sea city and its three ports, exchanging prisoners and alleviating blockade imposed by Houthis on Taiz. The redeployment plan's first phase includes troops pullout from the ports of Hodeida, Salif and Ras Isa and from the city's critical parts in connection with key humanitarian facilities.